Updated: Apr 16, 2019 @ 6:31 a.m.
To adopt an animal, you must live within approximately 100 miles of one of our adoption sites (Benld, O'Fallon or Springfield IL), and be at least 18 years of age. We require that you be physically present to make the final adoption arrangements. We also require that all cats be kept indoors, and all dogs be kept in a fenced-in yard, secure pen, or indoors. Failure to comply with any of these requirements may constitute grounds for our taking back the adopted animal. All pets have been spayed/neutered, are up to date with shots/vaccinations, have been micro-chipped, and are in good health to the best of our knowledge. If you have any questions about the animals, want to know more about the shelter, or have any other questions, please call or e-mail us as per above. If you are interested in adopting any of these animals, you may begin the process by downloading the adoption form below, and submitting it to: Benld Adopt-A-Pet, PO Box 53, Benld IL 62009-0053, or by visiting us at 807 Stewart Rd in Benld IL, or by attending one of our mobile adoptions in O'Fallon or Springfield IL. We strive to keep our listings of animals available for adoption as up to date as possible however, due to the constant turnover at the shelter, this page may not be completely current at all times. Therefore, if you are looking for a specific animal, please contact the shelter as above to find out what is available. We have dogs arriving at our shelter all the time so, if you do not see what you are looking for on this page, please call us at 217.835.2538, or e-mail us at aap1@frontiernet.net , and tell us what you are looking for. Also, we frequently have puppies too young to be listed on our website, which will however be available once they are spayed/neutered and have their shots. Just make the call and we'll get started on finding you the dog you want. The above video of Sarah, a licensed dog trainer, working with Kruger, a German Shepherd/Belgian Shepherd mix, was taken at the shelter on Monday, September 10, 2018. Benld Adopt-A-Pet is committed to doing all we can to insure that our animals are prepared to fit into their new homes. Above is another video, also taken at the shelter on Monday, September 10, 2018, of Sarah working with Lotus, a Labrador Retriever/German Shepherd puppy who, thanks in part to the training she received, is already in her forever home. This is a video taken on 10.20.17 of various dogs in the outdoors exercise pens. We give the dogs as much time as possible in these pens, subject to weather conditions. Note: Though you see "igloos" in the pens, these are provided only for the dogs to use while outdoors during the day. All dogs are housed indoors at night and during inclement weather. Comments: Beans came to us from his owner who acquired him from someone who was going to just release him on the road. His new owner had him for around three months, but was unable to keep him long term. Beans is your typical Chihuahua, reserved and cautious, and it takes him awhile to warm up to someone. Beans is looking for a quiet adult home, with perhaps a small fenced yard or pen to run around and exercise in. "Adopt me and I promise not to 'spill the Beans'." Comments: Originally relinquished to us by her owner as part of an unplanned litter, Blossom was adopted as a puppy and returned to us on 08.16.18 because the family didn't have time for her. She is very sweet, gentle and friendly and loves being around people. "My name is Blossom, and if you adopt me our love will bloom like a flower." Comments: His owner was moving from the farm where Cash had plenty of room to roam and his new home wasn't suitable for him, so he came to the shelter in the hope that we could place him in a loving home. Cash is somewhat larger than most labs, as he is part English Labrador, stockier, and with a bigger head and broader chest, as well as a more "cuddly" appearance. Cash is a a very friendly, loving, gentle giant who will make for a more relaxed companion. He is looking for an inside home but does like being outdoors a lot as well, and he needs a large securely fenced yard to exercise and play in. "My name is Cash, but I never wrote or sang country songs." Comments: His owner had no time to care for him or his companion, so Chico came to see us about finding him a suitable home. He is very skittish when you first meet him, and it takes him some time to get to know you. Chico is a one person sort of a guy who needs a quiet adult home, as he gets overwhelmed when surrounded by a lot of people, and especially young children. Once he gets to know and trust you, Chico loves attention and he likes to sit in your lap. "My name is Chico and I'm looking for a nice quiet home to settle down in." ​Comments: Darren, is not quite as shy and reserved as his sister Dawn, and is ready to embrace anyone who might consider taking him home with them. He is a somewhat large dog and really needs a fenced yard to give him the space he needs to romp around in. Darren is very loving and will make someone a very loyal companion. He would be delighted if he and his sister could go their new home together. ​"Oh; how I long for a yard to roam around in!" ​Comments: Dawn is a little timid when she first meets new people however, once she becomes comfortable with you, she will warm up and seek your affection in return. She was brought to the shelter some time back along with her brother Darren and, at present, both are still there awaiting their new homes. It would really be great if they could both go to their new home together! "I would really like to stay together with my brother if possible." Comments: Dusty was one of many ... too many ... for his owner to care for, so he was relinquished into our custody. He is a little bit timid when he first meets someone new but, with a pat on the head and a few kind words, he will quickly warm up to you. Dusty is a little guy, so needs a gentle loving home to call his very own. Will YOU be the one to open up your heart and home and give Dusty a second chance at living a happy life? "Look deeply into my eyes ... please!" Comments: Jack has already had two homes during his short life so far and is hoping that the third will be his lucky -- and final -- stopping place. He is a very active and energetic boy who needs room to run in and work off some of his excessive energy. He was adopted but returned shortly thereafter on 05.14.18, as he proved to be too active for them at their age. Jack was adopted again and returned on 12.08.18, as he turned out to be very hyper and they were unable to keep up with him due to their health concerns. This sweet but energetic boy needs an inside home with a securely fenced yard to run around and play and exercise in. "My name is Jack and I can run like a Jack Rabbit." Comments: His owner had moved out and left Jordie and his pal Rennie behind to fend for themselves. It's thought that they had likely been in the house without food for a week or more and, had they not been rescued, would likely have slowly starved to death. Jordie was thin but not as bad as his friend Rennie, and he is now gaining his weight back slowly though he still has a ways t go before he is back to where he should be. Jordie is an energetic boy who is looking for an inside home with a securely fenced yard to safely play in with his new family. After undergoing an experience such as he did, doesn't he deserve a chance to live out his life in a happy loving home? "My name is Jordie and I just want to go to a loving home." Comments: Juliet can be aggressive towards some other dogs, so she should be introduced to any potential new housemate beforehand. She decides who will be allowed to handle her, though she will warm to you after she gets to know you. Like most of her breed, Juliet is very energetic and loves to run and romp around whenever she gets a chance. She would love to demonstrate just how sweet and affectionate she can be with you in your home. Juliet would prefer a home with no other dogs or young children. "My name is Juliet and I'm looking for my Romeo." Comments: Mason is at the shelter because his owner is preparing to move overseas and can't take him along. He is a sweet, fun loving, and very intelligent boy, who enjoys spending time with his people and is always up for an adventure. He is wary of strangers and is an excellent guard dog, who is protective of his owners and their property. When Mason is out in public, or at other homes, he is somewhat less protective of them. He has had a minor "bite event" in his past. He had somehow gotten out of the yard and, when someone he didn't know tried to take him back home, he nipped them on the ankle. Mason has had some extensive training, and he knows several voice commands and key words, though he could benefit from some further training. He is not aggressive, and is actually quite the gentleman. Mason is looking for a cozy inside home with a large securely fenced yard, along with an owner who is very loving, caring and understanding of his needs. "My name is Mason, but I've never been south of the Mason-Dixon line." Below is a short video clip of Mason with friend Bill, taken at PetSmart in Springfield on Sunday, November 26, 2017. As you can see, Mason seems a bit bored by it all. Comments: Relinquished to the custody of the shelter due to the owners health, Odin is a very big and strong boy, however he is also quite gentle, house-trained, and has lived with children and small dogs. Odin is looking for a good home with a family prepared to take such a large boy into their household, and who can also provide a securely fenced large yard for him to exercise and play in with his new family. "My name is Odin and if you adopt me, like the viking warrior I'm named after, I will protect you." Comments: Ozzie was adopted as a puppy and returned to us on 05.25.18, after he had been found running at large and subsequently picked up by Animal Control. This guy will be a great and loyal companion for the person or family who winds up adopting him. Ozzie wants and needs an inside home with a fair sized securely fenced yard to run and play in with his new family. "My name is Ozzie; I don't know where Harriet is." Comments: Rascal was relinquished to us by his owner who had no time to provide him with the attention or training that he needed. He is a cute little guy, very active, but a bit timid until he gets to know you. He hasn't been around a lot of people or other animals. Rascal really needs a very patient and understanding owner, who will provide him with the training and attention that he needs. He was adopted on 06.21.18 and returned on 07.08.18. He had spent so much of his young life in a kennel that he can be nippy when he doesn't want to go back in. "My name is Rascal, and I can be one, but I can also be very sweet and loving." Comments: Reagan came to us with his mom and siblings. He was adopted as a puppy on 05.02.09 and returned to us on 09.24.11. He was found running at large after his owners moved and left him behind. He was Heart Worm Positive when he returned and subsequently was treated and re-tested negative. He will need to be on Heart Worm Prevention the rest of his life, but this is no big deal. Reagan was adopted again on 06.19.14 but returned to us on 09.09.15 by Animal Control. His owner passed away and there was no one to care for poor Reagan. This sweet boy deserves to find his forever home and to never have to worry about being left behind again. "My name is Reagan, though I'm not related to that guy who used to live in the White House." Comments: His owner got him at a flea market and took him (and his sister) home because she felt sorry for them. However, as it turned out, kind hearted though she was, she was simply unable to care for them, so she wound up releasing them to the custody of the shelter. Reginald was adopted shortly thereafter on 06.23.18, but was returned on 09.09.18 due to a family members allergies. 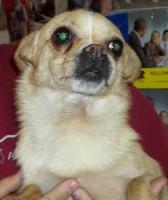 Reginald is looking for an inside home with s large securely fenced yard to run around and play in with his new family. "My name is Reginald and, if you adopt me, It'll be Sir Reginald, and I'll be Lord of the Manor." Comments: Rocky was relinquished to the custody of the shelter shortly after being adopted as a puppy. It seems that they got themselves a puppy, THEN found out that the landlord wouldn't allow them to keep it. Due to poor planning on their part Rocky, through no fault of his own, found himself in search of a new home. He was adopted but returned on 08.01.14 because his family was moving and couldn't take him along. He was adopted again and returned on 12.08.18 because he was too big for the wife to walk. Rocky is a wonderful sweet boy, who is house-trained and gets along with other dogs and cats. He is afraid of thunder and storms, and he DOES NOT like to have his feet or paws touched and will bite, which makes it very difficult to trim his nails. Rocky needs an inside home with a large securely fenced yard to safely play in with his family. "Though my name is Rocky, I'm a lover, not a fighter." Comments: Sandy was relinquished to our custody by her owner who had too many dogs to be able to care for them all. She is a sweet little girl, but she is also very timid and is easily frightened by strange sights or sounds, including coming into contact with any person she isn't familiar with. Sandy does crave affection and would love to have her own home with a kind and patient person who is willing to work with her and help her overcome her fear of the unknown. She would like to have an inside home with a yard or pen to run around in while she is outdoors. "Though my name is Sandy, things have been sort of rocky for me so far in life." Comments: Sugar Plum and her two siblings were left at the door with a note attached asking us to find them a good home. She was adopted shortly thereafter on 05/11/2011, but returned to us on 01/18/2019, after she was found running with another dog along I-255 near Edwardsville. She is sweet and very friendly but cautious of new surroundings. She knows some commands and walks well on a leash. Sugar Plum is looking for an inside home with a securely fenced yard to safely play in with her new family. "My name is Sugar Plum, and I'm hoping to go to a new home before I turn into a prune." Comments: Tiny came to the shelter because his owner had passed away and there was no one willing or able to take him in. The only person he knew is now no longer there for him, and so he is feeling somewhat sad and lonely. Tiny needs an understanding owner in a quiet adult home. Tiny does have a nervous condition that causes him to tremble at times. Since he doesn't see too well, it is suggested that you approach him slowly and speak to him so he knows you are there. "My name may be Tiny, but you know what they say about good things coming in small packages." Comments: Wilson was transferred to us by Animal Control when his time there was nearly up. He is a very sweet, friendly and mature little guy who just wants to be loved, and would love to have a home of his very own. Wilson was passed over due to his age and special needs, as he is also vision impaired. 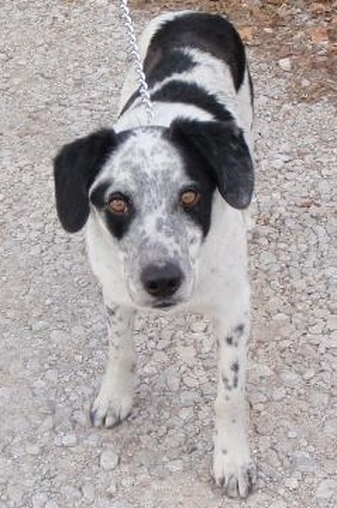 He would do very well in a home with a companion dog to help show him the way. Wilson has been given a second chance at life; will you give him a chance to live that life with you? "My name is Wilson; 'will' you let me be your 'son'?" Comments: Zaney was relinquished to us by her owner who was downsizing. She is a very friendly little girl, but hasn't been around people or children, and so tends to be a bit on the timid side when she first meets you. With plenty of love and attention however, she will likely quickly adapt and before you know it she will be your best friend and follow you everywhere. "My name is Zaney and, if you adopt me, I will keep you entertained with my 'zany' antics." Comments: Released to the shelter by his owner who could no longer continue caring for him, Zeus may be somewhat timid around someone new at first, but he will likely become quite friendly once he gets to know you a bit. He is basically a sweet little guy, who may have experienced some unpleasant circumstances in the past. Though he would prefer a cozy home with adults and older children, Zeus might adapt to a friendly family home as well. Take a real close look and see if that face doesn't remind you of a certain character in Star Wars. "May the force be with you ... and me too!"